"You need to be baptized." I remember the youth pastor saying those words to me over lunch at Bojangle's. He explained that it was a step of obedience to the command of Jesus, so I needed to sign up at the church office for a date to get myself plunged into the water. "But don't worry," he added, "we only hold you under there for about 60 seconds!" Of course he was only kidding about being under the water for 60 seconds, but I guess that was his way of making a 17 year old comfortable with idea. As I reflect on that lunch conversation, I think the youth pastor could have (should have) given a better reason to be baptized than simply, "Jesus commands it." As a pastor at a Baptist church, he certainly didn't want to say to say that there's more going on than meets the eye. That would have bumped up too close to "mystery" for his liking - after all, mystery is one misstep away from "magic," so the line of reasoning apparently goes. Don't get me wrong, that "Jesus commands it" is reason enough to be baptized, but I have come to believe that there's more going on than simply this. Having learned a bit about church history, I now understand why he took that "Jesus commands it" approach. Protestantism (of which Baptists are a part) began as a protest against the hierarchy and ritualism of the Catholic Church in the Middle Ages . To risk an overgeneralization, the Catholic Church had a magical view of the sacramental process. For them, taking part in the ritual was automatically connected to receiving the benefits of it. Protestants insisted that baptism, for instance, if unaccompanied by belief, was defective. But in most cases they stopped short of actually saying that baptism, if accompanied by belief, was in any way effective. My first experience with the Lord's Supper (alternatively called "Eucharist" or "Communion") happened in a similar downplayed fashion. It was presented more as a time of personal repentance than public remembrance. And nothing about it was geared toward proclamation, as in 1 Corinthians 11:26: "[E]very time you eat this bread or drink this cup, you are announcing the Lord's death until he comes again" (NLT). If someone had asked, "Is anything actually happening in this act?" The response would have been, "Yes, we're remembering that Jesus died for our sins." That's true, but once again, I think it stops short of embracing the sacred mystery that is transpiring in the action. The mystery is that the water, the bread, and the wine do something in and for the people of faith. John Wesley's phrase, "means of grace," is one that I find especially helpful here. In a sermon by that name, Wesley said, "By 'means of grace,' I understand outward signs, words, or actions, ordained of God, and appointed for this end, to be the ordinary channels whereby he might convey to men, preventing, justifying, or sanctifying grace". Many of my Baptist readers are unfamiliar with this term (they often use the term "ordinance" to signify the same elements), so I begin with a definition. Sacraments "are everyday things or actions through which God's graciousness transforms or sanctifies persons in order that each may fulfill their spiritual destiny as God's creatures". Or, you could say with St. Augustine that a sacrament is "a visible form of invisible grace." The term "sacrament" comes from the Latin word sacramentum, which is how the Latin versions of the Bible translated the Greek word mysterion. Protestants recognize two sacraments which are classified as "dominical" or Christ-initiated. They are baptism (see Matthew 28:19) and the Lord's Supper (see Mark 14:22-26). Roman Catholic and Greek Orthodox churches recognize five additional sacraments: confirmation, marriage, holy orders (ordination of deacons, priests, and bishops), penance (confession), and anointing (unction, usually close to the time of death). I'm not Catholic, and I don't really have any comment on those extra five because I haven't given them much sustained thought. I worship, think, and write from a Protestant position. I think that "mystery" is a good word for what's happening in the sacramental events. The recorded experiences of the church down through the centuries insist that something transformative is transpiring in the actions, but I don't find any basis to say that actual physical properties of the elements are being changed. People are changed in the process, but the water is still H2O, the bread is still flour and yeast , and the wine is still extracted from crushed grapes. In other words, I believe the transformation brought about by the sacraments happens in the people who partake of the elements, but not in the elements themselves. Stanley Grenz, the late Baptist theologian, is helpful in bringing all this together. He refers to the sacraments of baptism and the Lord's Supper as "visual sermons." By this phrase he means they "are visual, symbolic embodiments of the constitutive narrative of the Christian community. ...Through these symbols believers reenact the story of Christ's death and resurrection as well as their conversion, that is, their own death and resurrection with Christ". I think it's wise to let these "visual sermons" communicate in their own way. If you try to explain the mechanics of why/what/how/when of the sacraments, then you do yourself a great disservice. Eventually (inevitably? ), you will squeeze the life out them. The wine will be stale, the bread will be moldy, and the water will be an inconvenience. They will no longer convey a sense of the sacred in tactile form. They will no longer act as a channel for the grace of God to penetrate ordinary life. And when that happens, you'll be left telling people that they should be baptized just because it's something Jesus said to do. Heaven help us! The alternative is to remember that, just like in the incarnation (or any other doctrine that describes the way God interacts with the creation), God is free to move in mysterious ways. Mystery is there to be entered into, not explained away. Click here for N.T. 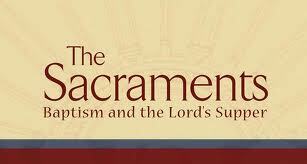 Wright's excellent presentations on Sacramental Theology from January 2007 at Calvin College. Daniel H. Williams, Retrieving the Tradition and Renewing Evangelicalism (Grand Rapids: Wm. B. Eerdmans, 1999), 19. Darren C. Marks, Bringing Theology to Life (Downers Grove: InterVarsity, 2009), 119. Stanley J. Grenz, Renewing the Center, 2nd ed. (Grand Rapids: Baker, 2006), 325-326.